One of the weak links on a 3rd generation RX-7 is its pre-catalytic converter. This item is not only restrictive to exhaust flow but over time degrades to the point where it will begin to break up and eventually clog the main converter. This leads to erratic boost patterns and possibly an overheated or blown engine. The pre-catalytic converter is designed to heat up very quickly to minimize emissions during startup until the main cat can get up to operating temperature. After the main cat is up to operating temperature it basically serves no function. Except to add close to 40lbs of dead weight to your car! So... the solution to this weak link - replace it with a straight pipe. 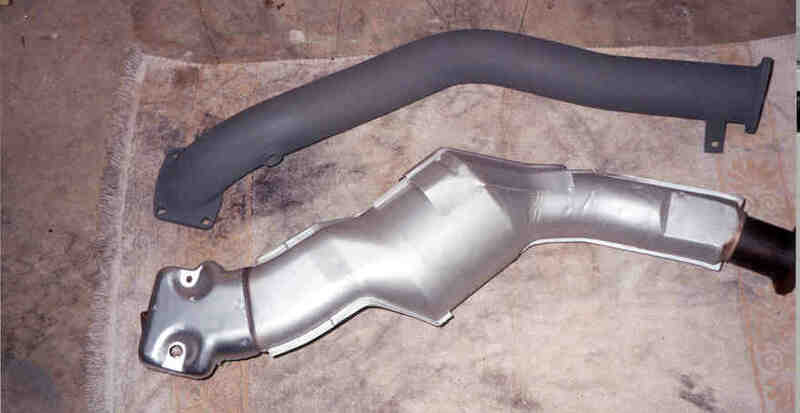 Pictured is my ATR downpipe that has been ceramic coated by Jethot. It is the ugly but functional 2000 deg. coating. The much prettier 1600 deg. coating would fragment in a matter of minutes on rotaries where exhaust systems temps far can exceed the 1600 deg. rating. (I can see my turbo housings glow red after a spirited drive!) The pipe is a full 3" stainless steel mandrel bent pipe with 1/4inch mild steel flanges. Fitment was difficult but not unduly so given the cramped working conditions. Out of the 6 that were bought on a group buy only one had difficulty with installation. The only hiccup was the misalignment of the hanger which was laughably misplaced. I ended up fabricating my own hanger bracket. The first thing any "riceboy" is going to do to his car, your's truly included, is add an aftermarket exhaust. Here again, I jump on the PFS bandwagon but with good reason. It is a full 3" stainless steel mandrel bent pipe. It is a one piece pipe unlike the Borla I had previously installed. It is one of the lightest designs currently mass produced, has a straight though muffler section and it looks great. 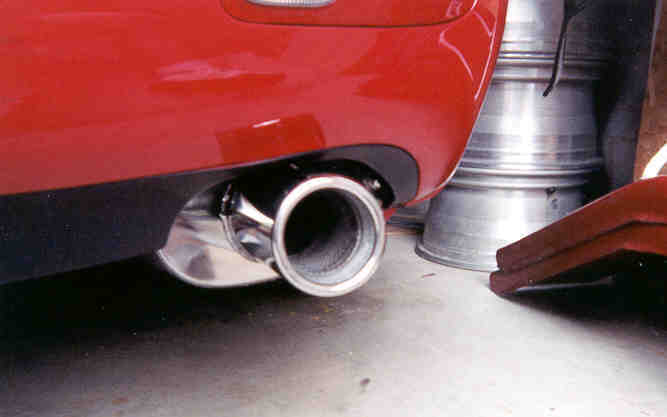 Highly polished rolled tip and muffler but with only a 4" tip its not too obnoxious. Fitment was very easy and took about an hour from drive in to drive out.